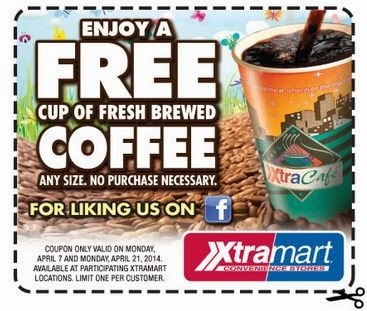 Get a free freshly brewed cup of coffee @ XtraMart. Just click the link below to go to the XtraMart Facebook page "like" them to get the coupon. Once you click on the coupon you can print it to take it to your nearest XtraMart to redeem it. This coupon is valid from April 7th, 2014 - April 21st, 2014.